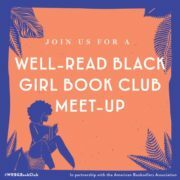 The AAMI is partnering with Next Page Books to host a Well-Read Black Girl book club. Check out our first selection! The AAMI/Next Page Books Well-Read Black Girl book club will kick off with a discussion of Nicola Yoon’s 2016 best seller, The Sun Is Also a Star. This novel explores the relationship between Natasha, “a girl who believes in science and facts,” and is facing the looming prospect of her family’s deportation, and Daniel, a boy who strives to be “the good son, the good student, living up to my parents’ high expectations.” Over the course of a single day the two meet and start to fall in love. The Sun Is Also a Star “[t]ranscends the limits of YA as a human story about falling in love and seeking out our futures” (POPSUGAR.com), making this an ideal book for readers of all ages. While this is a free program open to the public, your RSVP helps us plan for space and refreshments. If you are planning to attend, please use the button above to let us know! Bonus: Show your event confirmation at Next Page Books to receive 20% off the selected monthly title. Next Page Books is located at 1105 3rd St SE in Cedar Rapids’ NewBo neighborhood. Click the image to download a flyer to share with your class or group!